This article guides you in how to save iPhone photos to your computer. Visit our Droid Transfer page if you need to transfer photos from Android to PC. Step 3: On the "Photos" tab, select the photos you'd like to save. Step 4: Press "Copy to PC" or "Copy to Mac" depending if you're on PC or Mac, and select a location on your PC or Mac for your photos to be stored in. To view the photos on your iPod or iOS device click the "Photos" button in the category list. TouchCopy lists all of your photo Albums (folders), Events and Faces on a list on the left. Clicking on one of these items will display all the items contained within that group. Double click the photo entry in the photo list. Click the "View Photos" button on the Photo tool bar. To return to the thumbnail views, click the "Close" button at the bottom of the window. Transfer Photos from iPhone to PC or Mac - Select an Album, Event or selection of photos and then transfer them to your computer hard drive by clicking "Copy Photos" button in the TouchCopy photos tool bar. TouchCopy will copy the selected photos to your save location specified in TouchCopy options. The photos will be transferred into a sub-folder called "Photos". By default the save location is a folder called "iPod Content" on your Desktop. 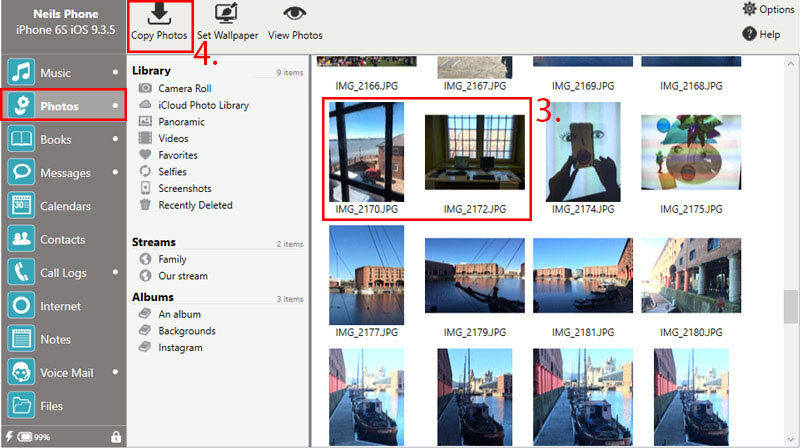 Select one photo to copy to your Desktop - click the "Set Desktop Background" button on the Photo tool bar. TouchCopy will ask you how you would like to size the picture to your desktop. Make a selection and then click "OK". Select an Album, Event or selection of photos and copy them directly into your Photos app by clicking "Copy to Photos" button in the TouchCopy photos tool bar. If you leave the selection blank, all of the pictures will be copied into it. The Camera Roll, too, is located in the list on the left, and you can interact with the photos and videos therein just as you would with photos in other albums. To copy all items in the current view, do not select any photos or videos and then click "Copy Photos" in the tool bar. To copy a selection of items, make the selection of photos or videos and then click "Copy Photos". To view photos and videos taken by your device's camera, double click the items in the list or select the item and click "View Photos" in the camera browser tool bar. TouchCopy will display the selected item, full size, in the view window.